Enter our most popular contest of the year! Dress up your horse--or dress up with your horse--to win. The top prize is a 3-month subscription to Giddy-Up Gift Boxes! Runner-up prizes, and prizes for commenters. We had many lucky winners for a starter pack from Horse Paradise...an awesome new horse game! Winners will be notified through the game. Congrats to Linn on winning this Saddle Box subscription box! Congrats to Skylar on winning a Pony Xpress Club subscription box...and congrats to Ananda our special runner up! Congrats to Lynn, who won a Betty's Strip Hair grooming kit for her entry -- Pyro the Scarecrow - in our 2017 Horse Halloween Costume Contest! Congrats to Janine for winning these gorgeous paddock boots for her entry - Safari Fun - in our 2017 Horse Halloween Costume Contest! Drea won these stunning riding breeches for her entry - Zombie Super Heroes Gone Bad - in our 2017 Horse Halloween Costume contest. The winners of our Rows of Throws contest are Shelly from Texas and Jesse from Indiana! Congrats! Winners of our Halloween Horse Costume Contest 2016 are: Lynn/Wizard of Oz (first place), Courtney/5 Seconds of Summer's Cal-Pal and Mike-ro-wave (second place), and Katherine/Alien Attack on An Astronaut (3rd place)! Congratulations! Congrats to Justin, Skylar and one other winner who wants to remain anonymous. I hope you enjoy reading Ariel! Winners of our Horse Quest Online contest are: Sydney (IL), Aylon (TX), Ilona (Poland), Nicole (UK), Isadora (Brazil), Crystal (Portugal), Dakota (MS), Hayli (CT), Hailey (TX) and Tina (TX)! Many thanks to Dineth and Maya at Horse Quest Online and congratulations riders! Winner of Troxel Helmets Rebel helmet giveaway is... Heather from New York. Congrats Heather & many, many thanks to Troxel! You are awesome! 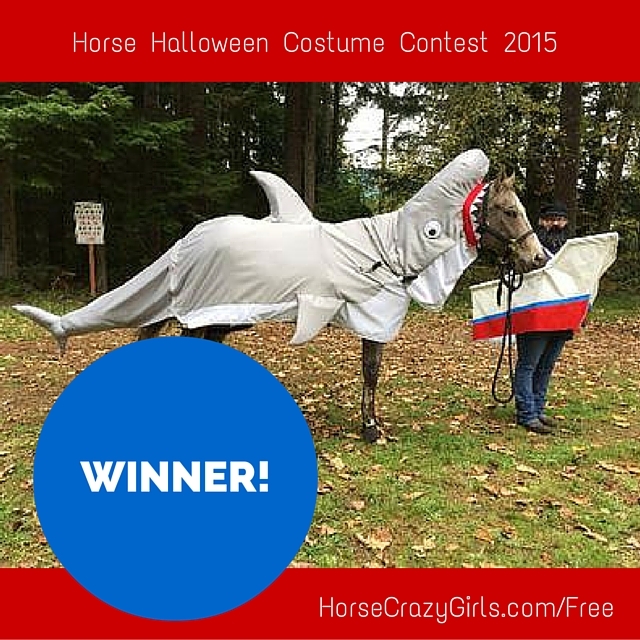 The winner of our Horse Halloween Costume Contest 2015 is "Catch of the Day!" Thank you Troxel Helmets for donating the awesome prize - a Troxel all-purpose Liberty helmet! The winner of the Troxel ES helmet is Lindsay from Florida. Congratulations! Congratulations to Elyssa from California for winning a copy of the awesome Fantasy Stables horse game! Alisha, Tania, & Caylee (from Canada and South Africa) won copies of The Perfect Distance by Kim Ablon Whitney. Morgan S from Wisconsin USA is the winner of the Heartland book series. Megan from Arizona is the winner of the book Chase by Sydney Scrogham. Congratulations to Chloe in Oklahoma for winning an autographed copy of Lucy’s Chance, the first book in the Red Rock Ranch series by Brittney Joy. Congratulations to Heather for winning a one-month supply of Platinum Performance Equine! Sadly her horse passed away several days after the competition but we are so happy he went out in style - and as a winner! He'll always be on our hall of fame. The social media competition is over and we are notifying the winners by email: Jesse W., Natalie D., Ashley B. and Anna M. Congratulations and thank you to all of you who participated! Congratulations to Grace from California for winning awesome horse treats and a horse game! 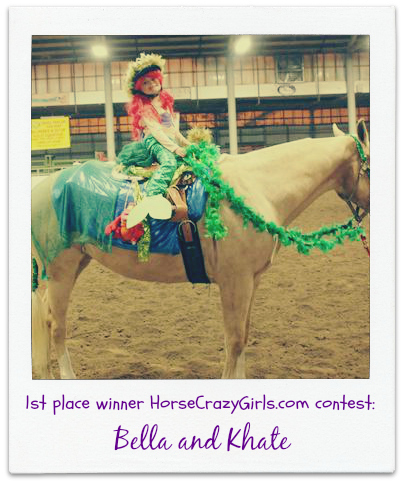 Our first place winner in the 2013 Halloween Horse Costume Contest was: Bella & Khate! The first place winner in our Halloween Horse Costume Competition 2012 was Jessi and Dexter! Marina from France won a beautiful Horse Whispers figurine! Erin from Missouri, USA, won a copy of The Girl Who Remembered Horses. The book The Perfect Distance went to Stefanie from Blair Nebraska USA, Monique from Tallangatta, Victoria, Australia; Celine from Canada and PaintedGoatLady. Grace won the first book giveaway for the books Dark Fire and Desert Song. Sisters Makayla, Sophia and Arabella won the second book, Samphire Song. Taylor from Australia won the first Horse Diaries book. Lucinda won Justin Morgan Had a Horse. Emma won the fifth book giveaway for the book Puddleby. Rachel won a copy of Wild Girl. Yvette won the first two books in the Timber Ridge Series by Maggie Dana: Keeping Secrets and Racing Into Trouble. 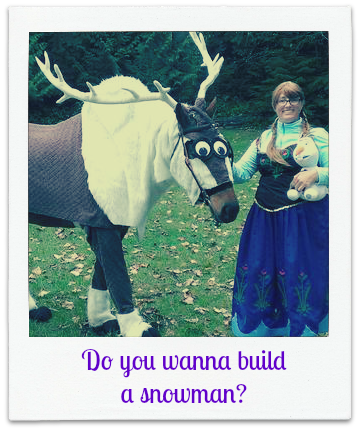 Even though this contest is over, you are still welcome to share your Halloween horse costume ideas and photos for fun! Hold Your Horses You're Invited! Our winners for this contest: Morgan B., Mandy P., Kelsie S., and Savannah N. We have notified them by email. Thanks for playing! Sign Up Here to Hear About Our New Contests! Sign up for our free horse club email list and we'll let you know as soon as new competitions are starting. 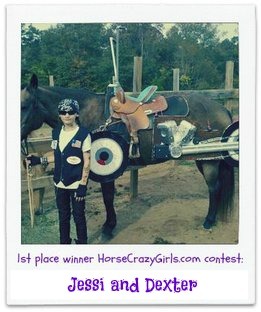 We won't use your email for any other purpose than to send you the free HorseCrazyGirls.com Horse Club email newsletter. Find more fun kids contests here!